Established in 2014, the gallery is home to an international roster of some of the world’s most recognized and culturally significant contemporary visual artists. Through its highly curated exhibition program, the gallery has garnered a reputation for highlighting artists – whose work directly challenges preconceived notions of contemporary visual culture – and affirming their place in 21st Century art. The 4,700 sq ft gallery space is made up of 14ft ceilings, pristine white walls decorated with high end artwork, raw concrete floors, and almost 60 ft wide floor-to-ceiling windows. 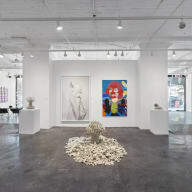 The Gallery is one of New York’s premiere commercial art galleries and the preeminent exhibitor of contemporary art.